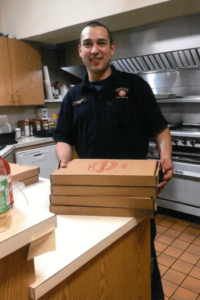 The Friends of Dallas Fire-Rescue Department Orders Pizza for DFD Members Unable to Attend Annual Awards Banquet. 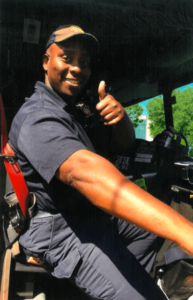 On Saturday, April 28, the Dallas Fire-Rescue Department hosted its annual awards banquet honoring the brave members of the Dallas Fire Department who risk their lives daily in service to our community. Unwilling to let any DFD member feel left out or go hungry Saturday evening, Chief Chris Willeford and Ray Cherry, President of the Friends of Dallas Fire-Rescue Department (a non-profit organization) contacted Campisi’s to arrange a special thank you to be sent to DFD members on-duty Saturday. 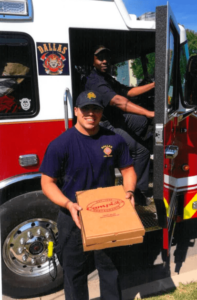 Campisi’s was honored to donate 152 pizzas to the cause, serving up in total, 241 pepperoni and Italian sausage pizzas to the eight Dallas Fire Stations. Representatives from our restaurants were also thrilled to attend the Dallas Fire-Rescue Department Awards Banquet. 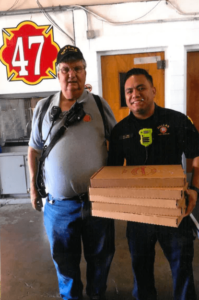 This is not the first year Campisi’s has had the opportunity to express our gratitude to the faithful Dallas Fire-Rescue Department — Campisi’s first partnered with the Friends of the Dallas Fire-Rescue Department in 2017 to donate 236 pizzas to members of the department who were on-duty and unable to attend the awards banquet. 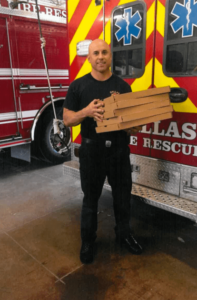 Both years, the Box 4 Fire Buffs Association picked-up and delivered pizzas to fire stations across Dallas. Each and every day, Campisi’s Restaurants invite first responders to stop by any Campisi’s location. All uniformed police officers, firefighters and paramedics receive 50 percent off their order.